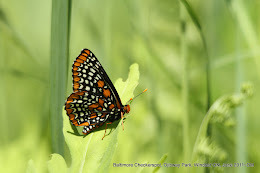 A recent posting by Josh V. (Ontario Birds and Herps) had featured beautiful Baltimore Checkerspot butterflies, a species that I've never seen in person before, so I figured I would go out and see for myself. Sure enough, just minutes after entering the Provincial Ojibway Reserve (across the road from the visitor center) I spotted the Checkerspot. Oddly enough, I saw it again days later at the exact same spot along the path. It's a very tame butterfly in my short experience with it. You can almost walk right up to it. When it flies, it hardly tries to avoid you, almost running into you. And in both cases, I walked away from it. It's not shy. I have been trying to get out to the Spring-garden area in West Windsor which is part of the Ojibway Complex. 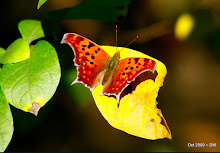 It is well reputed as being a great spot for butterflies as well. The Mourning Cloak butterfly above was seen there as well as many uncooperative Giant Swallowtails. 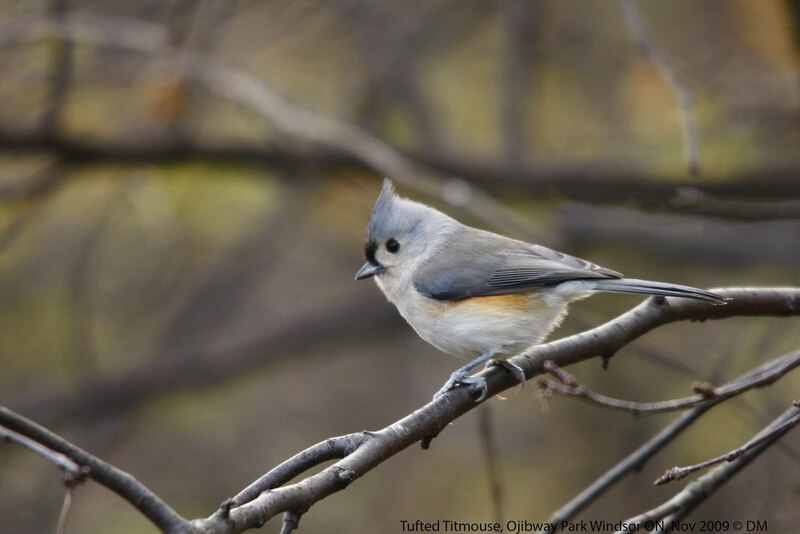 Black Oak Heritage Park has been good for butterflies and birds as well. When you approach Ojibway, make a point of looking in the pond as you drive in. Saturday, I saw a female Wood Duck with 11 or so baby ducklings. Belted Kingfisher on the Owl Nestboxes of the Ojibway pond. Always interesting to see. The Wood Ducks and the Kingfisher were taken from inside my car as entered the park. I also brought my wife and son to see the new Ojibway Nature Center this Saturday (it was really our first walk through the new center). My son is two years old and I hope he can learn so much from the staff, programs and resources at Ojibway. My son already enjoys bird watching! 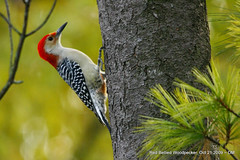 We look at Robins and American Goldfinches in our back yard and he points at them, smiles and says: "bir-bie!". In my front yard, I have a fruit-bearing Mulberry tree which has attracted many birds as of late. This week I have my first Cedar Waxwing as a yard bird. I also have been given great views of House Finches, Goldfinches, and Robins. On Father's Day, I visited relatives in LaSalle, just near the corner of Huron Church Rd and Cousineau (Near Windsor Crossing or St Clair College). There is a school with a stormwater detention pond (map) and soccer fields next to it. It seems like this pond has been a little bit of a migrant trap or an oasis in an otherwise urbanized / monoculture farmland environment. Today, I spotted a Mallard Duck family, Great Egret, Killdeer (many), and Spotted Sandpipers (many) ! This seems to be pretty nice shorebird habitat, and I think I will keep an eye on it more in the late summer/fall (or pay my little nephew to keep an eye out for me). Is this the only shorebird habitat in Windsor/LaSalle? I'm not aware of any other spot that has mudflats in Windsor! I hope to see Baltimore Checkerspot soon. Haven't come across one yet this year. Maybe on the Ojibway count in two weeks! I heard that the first Hickory Hairstreak showed up today at Brunet Park. Glad you got your Baltimores, Dwayne! Also, thanks for the heads up on the shorebird spot - I'll keep an eye on it as well in the future. By the way, an area on my study site (inside the black fence along Huron Church) has some decent shorebird habitat (though very small). It currently has a few Spotties and Killdeers, and in the spring hosted both Yellowlegs and Solitary Sands as well. But yeah, Windsor isn't exactly a hotspot for shorebirds. Check out the Tilbury lagoons sometime this summer - last year there was about a month with excellent habitat. The water levels are currently high but hopefully will be lowered soon. Also, some fields in East Windsor (particularly off of Banwell or Lauzon Pkwy) usually had flooded areas and lots of shorebirds in the spring - mostly Dunlin. Thanks for the tip on the butterfly and also on the shorebird spot.